Google has announced to block the auto play feature in Chrome 66. This step will offer a better browsing experience to the users who get irritated with advertisements barking right as they log in to the website. Many game developers complained that blocking auto play is interfering with their gaming experience. Accordingly, Google is working towards resolving the issues both for the users and developers. To avoid such ads on your Mac, carefully select a free VPN for Mac or a reliable paid VPN. How Do Auto Play Ads Work? You may or may not be aware, but your online activities are always under a scanner. And Google along with the social media websites do it all the times. For example, when you search online for the best mobile phones, you must have noticed similar ads popping up on your screen. This is possible due to your internet logs. However, these ads are unnecessary and disturbing many times. E.g., these ads pop up when you are working on some project, or reading some important article online, or in the middle of your presentation. A VPN allows the internet user to transfer sensitive data such as details of credit card or any other personal or business data discreetly, even when they are connected to a public Wi-Fi. Next time if someone asks you what is a VPN? You have to tell that a VPN is a system that will help you in securing your data and browsing history from all kinds of notorious eyes out there. Should I Choose Free VPN For Mac? Use of a VPN service personalizes the browsing experience. It also offers a list of benefits. However, you should pick a paid VPN service like Le VPN than choosing a free VPN for Mac. Such free VPN providers may sell your data and browsing habits for their financial gains. Therefore, your data security is at risk. If you happen to be a MAC user, then there is surely good news for you. 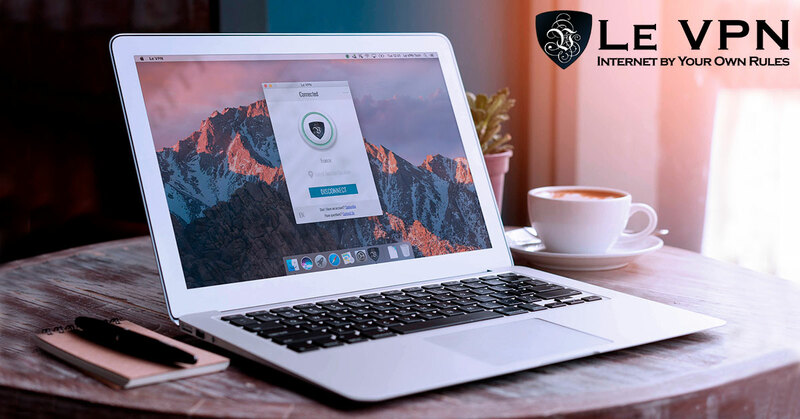 There is a plethora of free VPN for Mac available in the market, but selecting the best free VPN for Mac can be a daunting job. The IP address is a unique numerical label given to your system connected to the internet. This IP address allows anyone to track down your location. When you use Le VPN, you replace your original IP address with the Le VPN’s IP address. Hence, no one can trace your real location. For example, you can use Le VPN’s US IP address while in India. And this will show your location as the US and not India. You are away from getting caught even when you bypass geo-restrictions. I.e., you can unblock US websites without anyone’s knowledge. Similarly, Le VPN offers a highly encrypted network for your online activities. Just subscribe to Le VPN and download the VPN software.